Punjab Public Service Commission has Announced 1385 New Jobs in Daily Jang Newspaper dated 04/04/2018. Candidates who are waiting For Public Service Commission Jobs 2018 can apply for these Jobs. 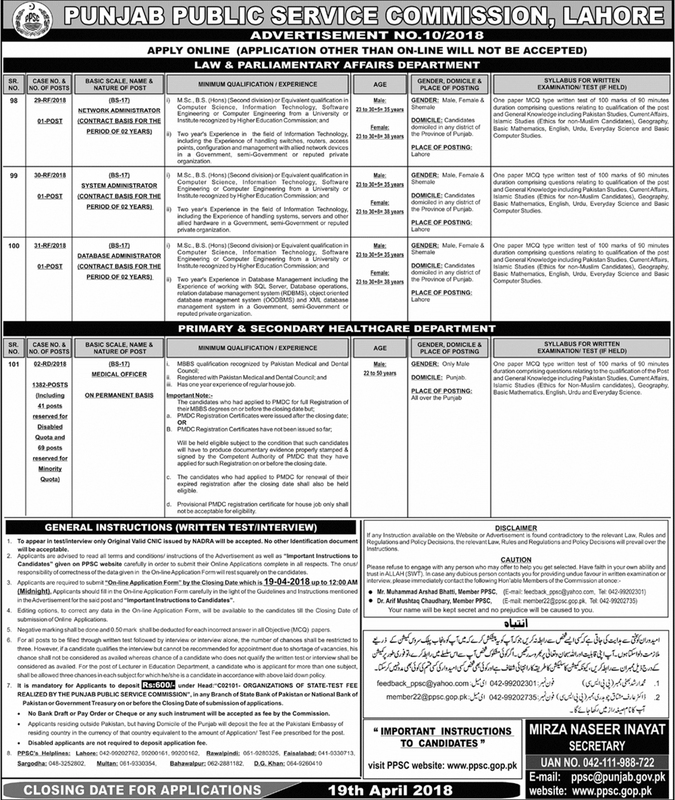 These Jobs Are Announced for Law and Parliamentary Affairs Department and Primary and Secondary Healthcare Department. PPSC is a Fair & Transparent Department that Conducts Different Recruitment Tests all over the Punjab in All Punjab Government Department located at Davis Road Near Shimla Pahari Lahore.. Interested Candidates can apply for Network Administrator System Administrator, Data Base Administrator, and Medical Officer on Permanent Basis. Posting of Law and Parliamentary Affairs Jobs will be in Lahore and Posting of Medical Officers will be All over the Punjab. Candidates are directed to Visit Punjab Public Service Commission Website to apply online. Important Instruction for Candidates that they should provide Correct Gmail Account as well As Phone Number. As all Correspondence with the Applicant will be made through these Information.